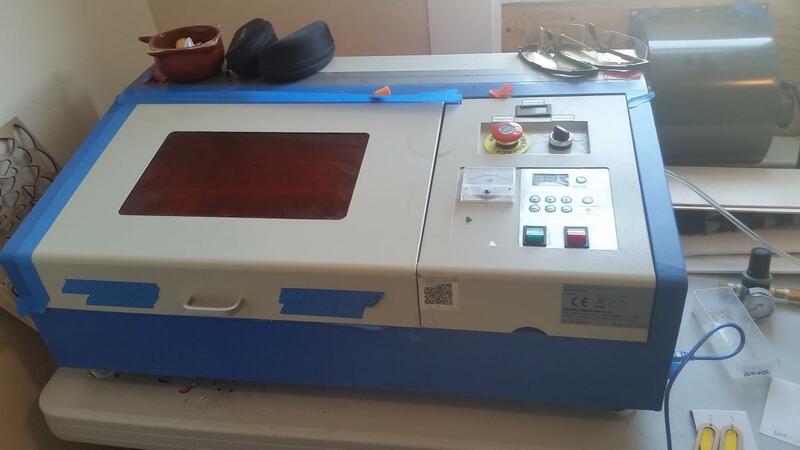 Friends have been asking about our K40 Chinese laser cutter. Here’s some quick info about our setup. This is our current setup. 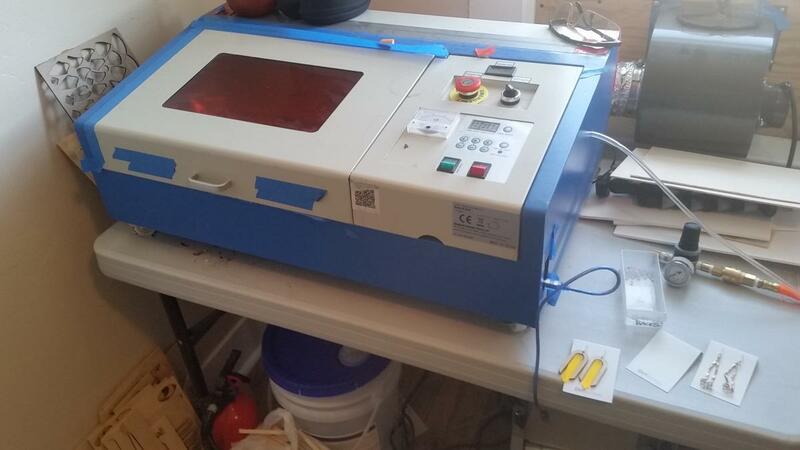 The machine currently goes for $418 or less on Ebay. I don’t recommend buying the absolute cheapest one, and look for one with reviews. Shipping is generally free. 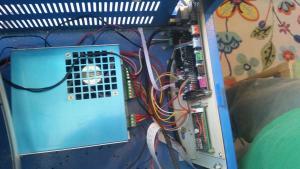 It includes an highly inadequate exhaust fan, and a minimal water cooling pump and hoses. Out of the box, it works ok and requires installing the included, pirated copy of Corel Draw on a Windows machine. We used VirtualBox to “firewall” the software. 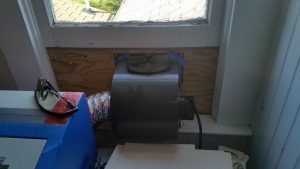 Below the table is a bucket filled with distilled water and the aquarium pump, which pushes cooling water through the laser tube. 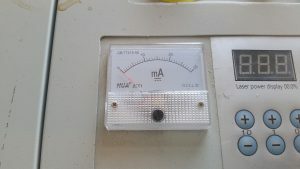 The first upgrade needed is a mA meter. As shipped, 100% power is far beyond the laser tube’s ratings. So an mA meter allows you to see what power you’re using and not prematurely burn out the laser tube. On our machine about 50% power was the max tube rating. Next we added an air assist nozzle to make cutting much more efficient and reduce flame. 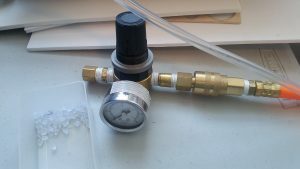 The nozzle was about $20 from lightobject.com. To provide air, we first tried an aquarium air pump that didn’t put out much flow. Next we tried a Rigid 6 gallon pancake compressor. It ran continuously and burnt out in a month. We’ve finally settled on a 10 gallon compressor that runs about 50% of the time when cutting at high pressure. You can also see the aluminum honeycomb bed that we added for about $20. The included “clamp” bed is not very functional and quite limiting. While adding the air assist, I also cut down the internal air duct, allowing us to cut about 20mm larger on the Y axis. We added a precision 0-50 psi regulator to control flow from the compressor, since it lives in the basement. From the regulator, air flows through 3/16 vinyl tubing. We added a cable chain to the laser head to route the tubing. It’s also possible to use coil tubing but we didn’t try that route. 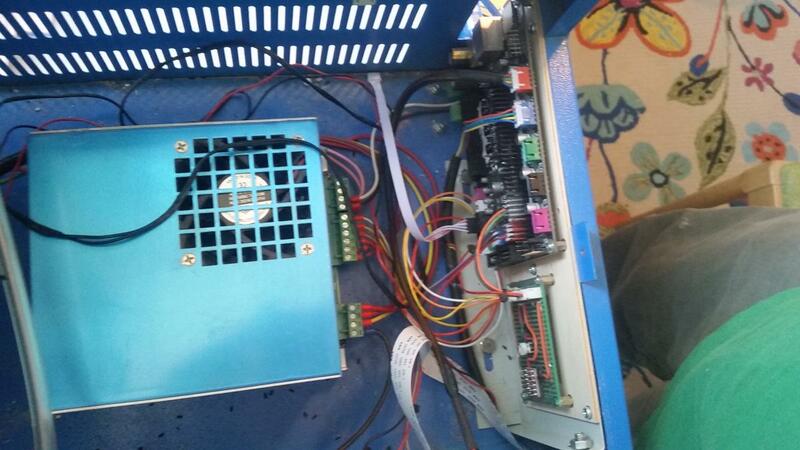 Next we wanted to get away from pirated Corel Draw so we replaced the controller with a Smoothieboard clone. The smoothie allows us to use raw gcode and our choice of software. This required a breakout board that someone else designed, ordered from OshPark. I also built a level-shifter board to step up the PWM laser power signal to 5V since the smoothie runs at 3.3v. The stock power supply is barely adequate, but will work until it burns out. Finally, after trying several inadequate exhaust fans we settled on a 465 cfm blower bought on amazon for about $120. 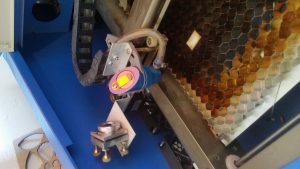 It’s attached to the back of the machine with a 3d printed 4″, 90 degree elbow. You can also see our safety glasses. They run about $40 per pair from lightobject.com, and are designed for the exact wavelength of the CO2 laser. We don’t operate the laser without them. For software, we’re using LaserWeb 4.0 to translate artwork into gcode, and to send to the machine. It’s designed for laser cutters and allows us to use SVG and DXF files directly, and assign different laser powers, speeds, operations, etc to different colors of outline and fill within our documents. This entry was posted in Uncategorized on May 21, 2018 by Chris Miller.